Homemade Thom Khem or Tom Khem ຕົ້ມເຄັມ (Lao Sweet and Salted Pork Stew With Hard Boiled Eggs) for dinner in Vientiane, Laos. My aunt likes to make this stew once a week because she can make a big pot for dinner and my cousins love to have the left-over for breakfast and lunch the next day. 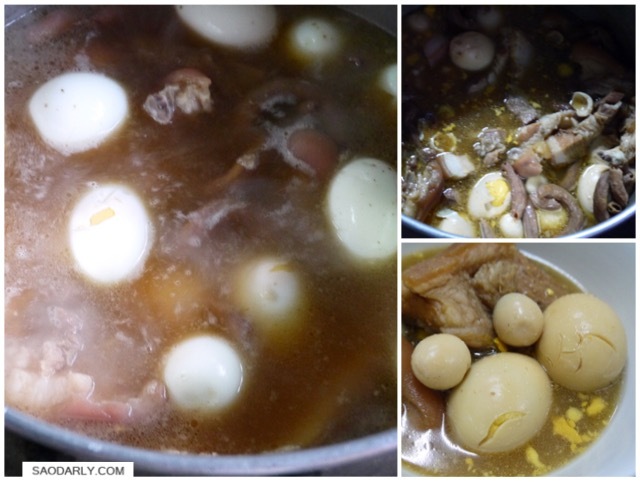 I bought a bag of quail eggs and asked my aunt to add to the stew with the duck eggs. My aunt also made chili dipping sauce to go with the meal. Even though I’m not a big fan of pork meat, it was a delicious dinner with freshly steamed Jasmine rice and chili dipping sauce.